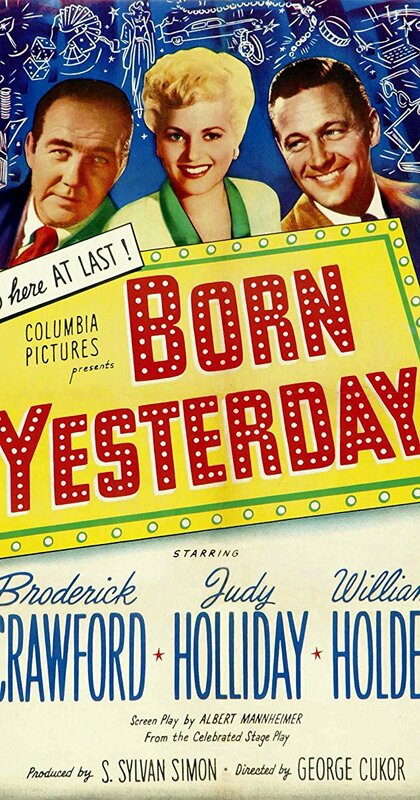 “Born Yesterday” is a charming, uproarious film that is held up by the strength and wit of its lead performance by Judy Holliday and the journey of self-discovery and assertiveness that she embarks on. While the tale of an uncouth impolite woman being tutored to integrate her into society is one that’s been told time and again, Holliday delivers her lines with such sincerity and blissful ignorance that it is truly wonderful to watch this brass showgirl change before our very eyes. Anytime Holliday is on-screen is a delight in how much she just owns this role. From Billie loudly playing the radio and singing to it while guests are trying to have a conversation, to her admitting that she is okay with putting very little thought into her life as long as she’s happy, to her genuine excitement as she circles every newspaper article so that her tutor, Paul Verrall (William Holden), will explain it to her. But even throughout these changes, she retains her sense of joy and wonder about the world – it’s just that that joy grows as her world grows. This is one of George Cukor’s funniest films, in a long career of witty comedies. The dialogue is overflowing with great lines and revelations as Billie’s ignorance begins to fade and she sees the world that her fiancée, equally uncouth junk tycoon Harry Brock (Broderick Crawford), has made for himself. The absurdly loud banter between Holliday and Crawford is charming in its own way, like watching two stubborn gangsters try to solve math equations, while the scenes between Holliday and Holden lead to some hilarious reactions from the two as they learn from each other. Overall, “Born Yesterday” is a simple yet refreshing movie about knowledge overcoming ignorance. Judy Holliday is captivating from start to finish, always curious and always enchanting. The script is a perfect mixture of comedy and drama without sacrificing one over the other, leading to a satisfying conclusion and journey for our captivating lead. I had a smile on my face the entire time during this one, and it is not hard to see why.